If you have read through our article on the history of table games you will know that they derived from lawn games such as croquet and golf. When these original games were first created the playing, equipment was made from wood i.e. wooden mallets or clubs and the use of wooden balls. Over the years the balls used on table games has developed to create a more reliable medium that is more durable and can be finished to create the perfect shape and size for each game. 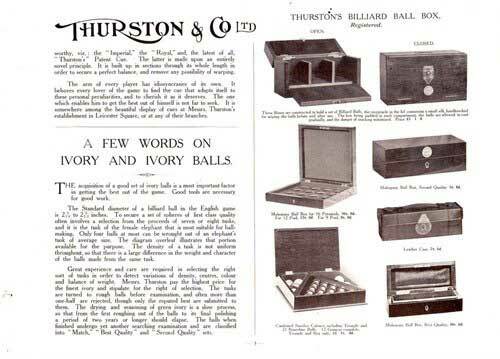 Thurston’s snooker image on billiard ballsWood is the not the longest lasting material and can easily chip so other materials were researched over the years to find a better-quality ball that could be more accurately made and would have a longer shelf life. Ivory was used quite early in the history of the games there are even records of this being used as far back as the 1580’s, ivory was used to produce the balls right up to the start of the 20th century. This soon lost its popularity in this century as concerns were raised about how many elephants were at risk just to get the amount of ivory required for this trade. In 1867 a new product called Sorel cement was invented, this had the same durability as ivory and could be finished to give the same smooth texture so proved to be a good alternative. By this time there were large monetary gains to be made to produce quality snooker and pool balls with new materials, one company namely Phelan and Collender even offered a cash prize for the inventor that could overcome this problem. Strangely this also lead to the development of the first plastics produced on an industrial scale. In 1870 one of the first plastics was produced “celluloid”, this worked fine but it had one bad slice effect. Part of the process of producing this involved the addition of gun cotton which is extremely unstable. There are reports of some of these balls exploding during play when shots were placed with some force. These accounts have never been verified but with all early development it is quite possible. Nowadays the plastics and resins have been refined to produce balls that are durable and can take the impact of striking other balls or even being dropped from the tables. There are two main compounds used in quality sets of balls namely Aramith, acrylic or even polyester resins. In the modern game, there are several options when purchasing the balls for your table and rules for each game determine the size of the playing balls used in tournament and league games the same as with the regulations covering the size of the tables. Snooker balls are regulated at 52.5 mm but there is a variance allowance of 0.5mm but due to the different materials that can be made for producing these there is no actual weight regulation. All of the balls must be the same weight though. With British Pool, there is a wider range of sizes used on the tables, the smaller sets have diameters of 50 mm right up to the larger sets which are produced up to 56 mm in diameter. Cue balls are also produced in a range of designs to help players improve their game, some will just have a simple black dot on them while others are produced with a range of markings that divide the cue ball into sections by the means of spots and stripes. These are training balls and help novice players when practicing at applying spin to the ball etc. You can even purchase novelty ball son them now which have specialized logos on them, these are often seen on pool tables to replace the plain and striped object balls. What must be remembered is that often-cheaper sets of balls are a bit of a false economy, at the end of the day you get what you pay for. Cheaper sets tend to use compounds in production that are not as reliable and long lasting, investing in quality sets will give you many years of use. In most cases a quality set of balls should only need to be purchased once for each table and will last you a lifetime of play.